I'm back today to show you my latest crocheted piece. I had fun working with this lovely Aqua color. This piece is 17" in diameter. their beautiful shade of aqua! Such a summer-ee color don't you think? These are sweet peas from my garden. out of my ears this year! A Year of Doilies, and this one is "March." So, I had to show him my book called "99 Little Doilies." This is a different pattern from the same book. I just had to show you the two colors together. I do have a reason for this lavender one though. I think she would like this. Her birthday is in August. I hope I can finish it...wish me luck! We haven't had rain in several weeks and I'm kind of missing it. I am a total sucker for teal or aqua. Just love them!! love the doily and the ball jar!!! so pretty! 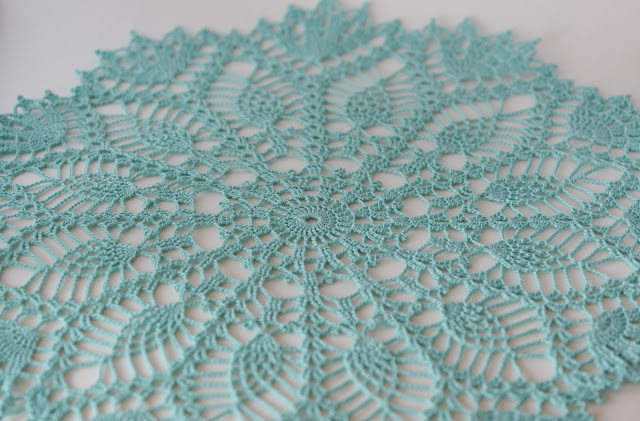 That's one beautiful doily, Becca! BTW, you can never have too many sweet peas. Things are pretty crazy here.... How did you enjoy the island? You are a Doily Goddess Becca and that turquoise jar with the sweet peas is so beautiful! 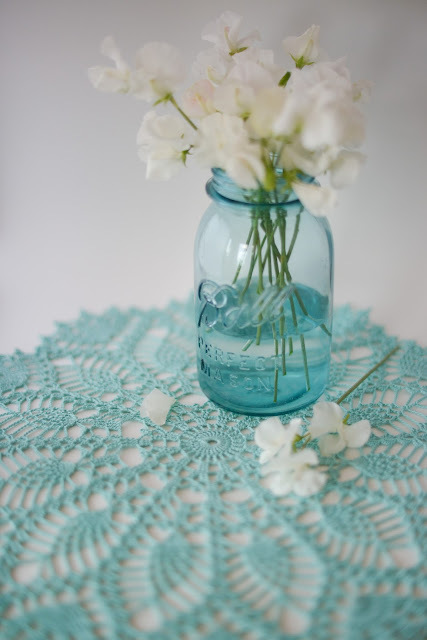 LOVE the aqua colored doily, it looks heavenly with the jar! 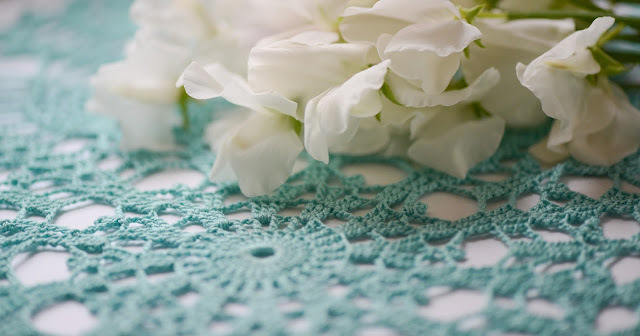 Your sweet peas, and doily shots are lovely...makes me nostalgic for all that rain. I am swooning over the pastel tones of your shots. The aqua and white are so perfect together, Becca! I love the way you composed each of these, also. Oh my, everything in this post is just beautiful! 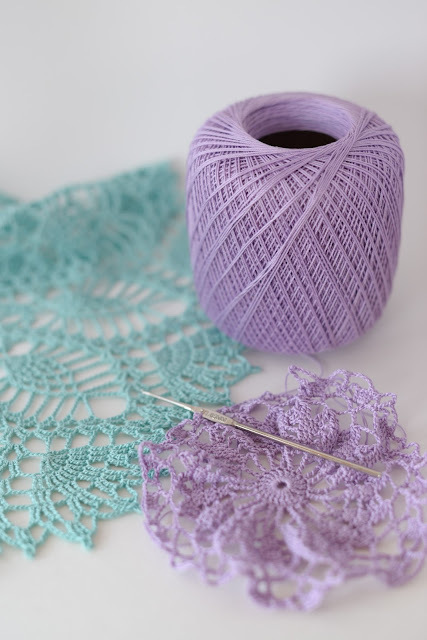 The doily! The colors! The Ball jar! The flowers! haha! Pure eye candy! Beautiful job on the doily! Love it!! The colors in your crochet are beautiful and my favorites. How I love sweet peas -- I guess I should try planting some in the fall. I like the colors of those jars as well. Refreshing! Wishing you a lovely week Becca! I can't believe its been that long since I have looked at blogs.. Where in the heck have I been..
Love, Love, Love this one my friend. That pattern is so pretty and it looks beautiful in that color. 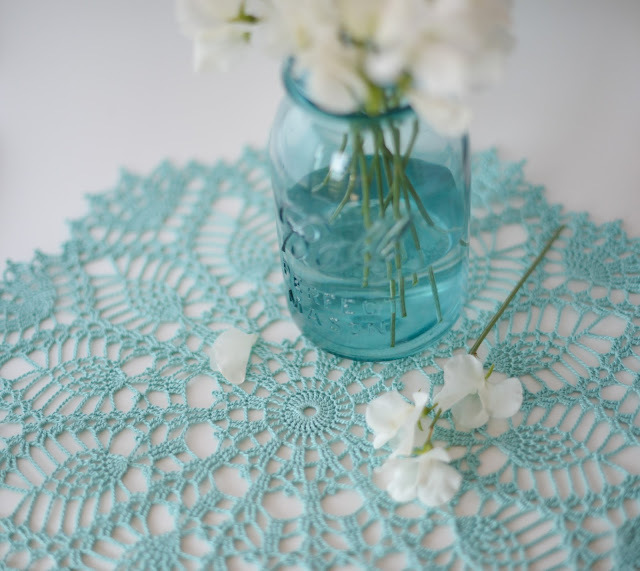 This doily is simply gorgeous! What a most beautiful color. 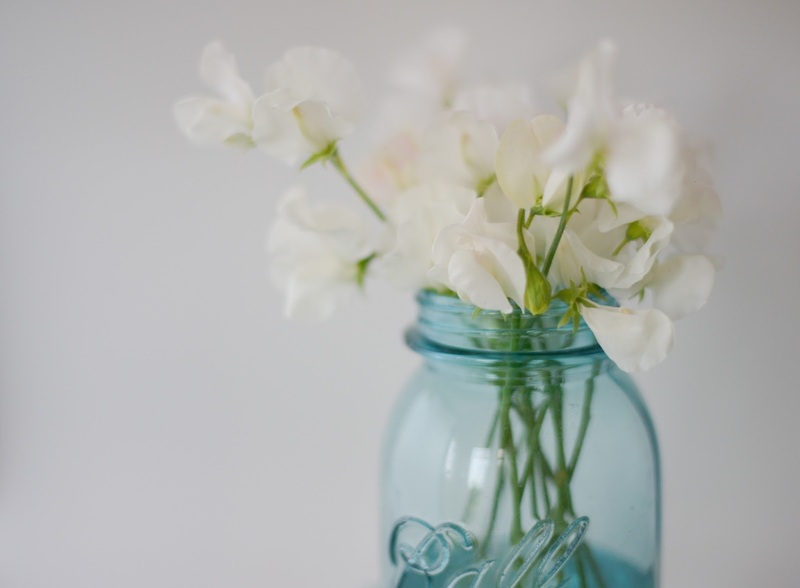 And the Ball jar with white flowers together with the doily make such a stunning centerpiece. I love it!